Standout tech features put the fun in Ford's Transit Passenger Wagon, one of our most popular passenger wagons. 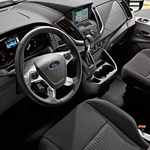 We here at Blake Utter Ford are fans of all the tech features on the Ford Transit Passenger Wagon. In the interest of time, we shaved our list down to the two most incredible features. Each Ford Transit Passenger Wagon includes a free one-month trial of SiriusXM Satellite Radio. We think SiriusXM is worth keeping for the long haul, since it offers 150 stations of commercial-free sports, entertainment and news. With your SiriusXM Satellite Radio subscription, you can access all 150 stations online or via mobile device with the SiriusXM App. SiriusXM turns long commutes and group outings into enjoyable journeys, with tons of music and exclusive content to pass the time. Ditch the need for manual operation of windshield wipers with rain-sensing wipers. This nifty feature entails wipers that turn on automatically in response to rain and adjust their own speed to the windshield's level of wetness. To see for yourself, enjoy a test drive at your earliest convenience.